Last night, I embraced the cold, to see if the hype I’d heard surrounding The Sandbar‘s open mic night was true. The bar itself is right on the beach in Praa Sands and on arriving it seemed to be a relatively quiet affair but the evening, hosted by Graham Baumbach from local duo The B.T. Experience, soon gained momentum. First up was Charlotte Killgallon (left), you can watch her videos on YouTube here. I LOVED her. Such a soft, breathy voice, deep and rounded. When we chatted she was delightfully sweet and blessed with humility. Currently living in Marazion you can catch her performing at Marazion’s Monday night Jam session in The Godolphin Arms. The other act that couldn’t go unnoticed were two young lads, Mickey Ponsford and Liam Fitzharris (below). 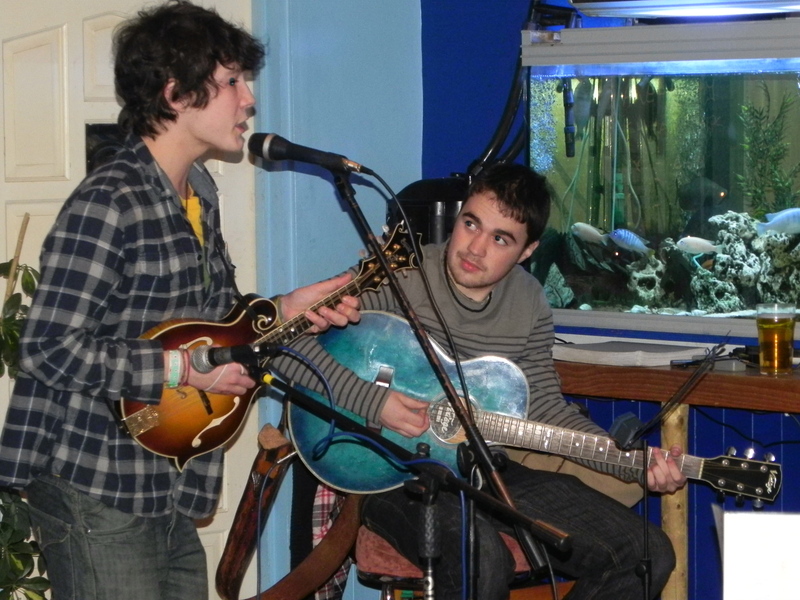 As half of Flats and Sharps, a bluegrass band from Penzance, they delivered a welcomed package of comedy and fast-paced-flat-pickin-mandolin! Mickey, who’s stage antics were surely influenced by the phenomenal Chris Thile, shared with me that they’re currently writing and recording an album. The recording is taking place, not in some swanky studio, but in Mickey’s family living room with the assistance of his father, who by all accounts is particularly enthusiastic regarding the boys musical endeavours. One thing that most interested me is how they are experimenting with a variety of different types of microphones to find ‘that’ sound. Talk of ribbon, condenser and dynamic mics sent my head spinning with excitement and I can’t wait to hear the music they’ve created. Breaking into a music circuit so defined as bluegrass may be quite a difficult task for a foursome of teenagers you might think, but these youngsters are clearly paving the way and quickly becoming a recognised name in these parts and beyond. Paul Brewer of The New Essex Bluegrass Band once said to them “If you’re the future of bluegrass, we’re happy handing it down to you”. And I’ll leave you with the following quote which tickled all of us who heard.. 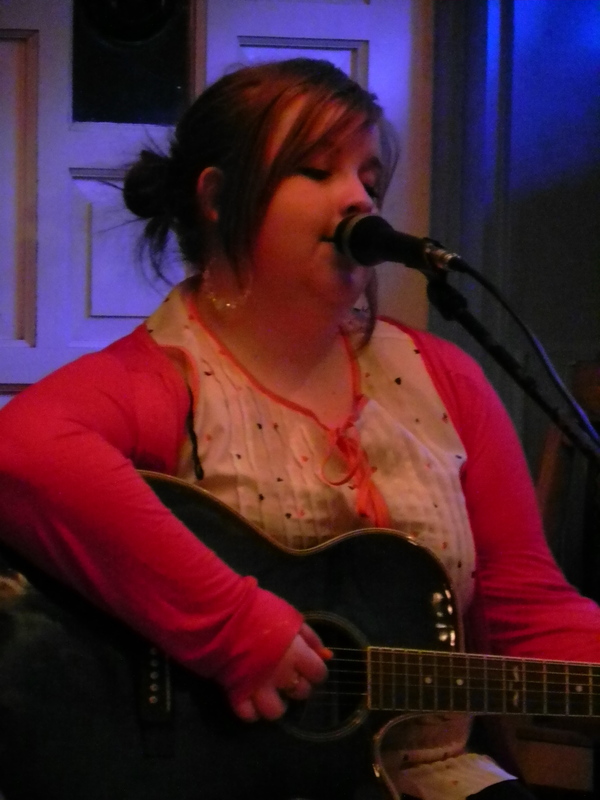 I was lucky enough to catch Charlotte Killgallon one night at the godolphin arms and her voice blew me away.. beautiful. Would have to recommend going down there just incase you get a chance to hear this girl.. you wont regret it i promise you!